Many thanks for helping us to move home. Your name is top of the housewarming party guest list. 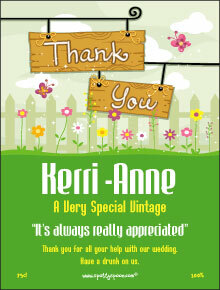 Say thank you in style with this classy label. Ideal for someone who is erudite and learned, this elegant design won’t disappoint. The sober, low key colours make it a good choice for a person of mature years. Download the label now and print it or let us print it for you, it’s that easy! Add the label to a bottle of fine red and let that person know how much you appreciate them. Suggested phrases are ‘elegant character’, ‘well balanced’ and ‘a simple blend of thanks and appreciation’. Spotty spoon are absolutely brilliant. The label's were perfect. Would recommend them to everyone in the future. Great product & super fast!